Bocas del Toro Over the Water Surf House - Bocas Town, Isla Colón Guests overall rating: ☆☆☆☆☆ 0 based on 0 reviews. Find fresh local produce as well as the imported foods you love from home. Bocas Town has it all. Our cozy bed and breakfasts offer three rooms. Each has walk-in showers with hot water and rain shower heads. Our rooms have WiFi as well as fans, one room has to air-condition. The rooms will make you feel like home! 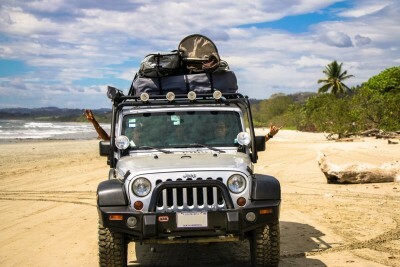 Bocas del Toro is Panama’s #1 adventure destination: go on a sailing adventure around the island chain, zipline through the rainforest canopy, scuba dive in some of the most biologically diverse tropical coral reefs in the region, learn to surf in warm Caribbean waves, or take on many other adventures. Let us be your concierge for anything related to Bocas del Toro. We have lived here for nearly two decades and know where to go and with whom. The house has a comfortable social area as well as a large deck to relax and take it all in. Full kitchen, cozy atmosphere, secure and colorful. We have fast working Wi-Fi throughout the entire house perfect for the digital nomad. Our rate is based on up to double occupancy. The house is painted and decorated in colorful Caribbean flair. Being on the bay with lots of windows allowing the breeze to flow through makes for an enjoyable and truly authentic visit. An in-suite large hot water rain shower. TV with AppleTV connected with Netflix, UFC FightPass, YouTube, Vimeo and other internet channels. Walk-in showers with hot water and rain shower heads. A large selection of books in different languages. The owners, Chapo and Angie will be your hosts during your entire stay. 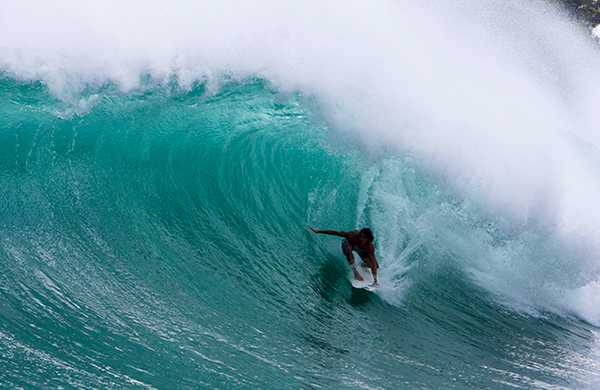 Nicolas or also known as just ‘Chapo’ from Venezuela has been surfing for over 20 years throughout many places in Latin America and the Caribbean. Angie a Panamanian from Panama City has been surfing and living in Bocas del Toro for 15 years and has competed at a national level. Both are surfers and love the ocean. Let us be your guide whether it’s where to go find the best waves or learn how to catch your first. We are vegetarians so if you are looking for tips on where to get great local produce we can help! Meat eaters don’t worry you are also accepted and we can offer you suggestions on where to get grass fed organic beef and meats as well as locally caught fish, crabs, and lobsters. Our kitchen is large and our guests are welcome to use it or we also offer private meals. All guests have a big delicious breakfast included with your stay. We have three dogs: Kimchi, Niña and Rumba as well as one cat Katira. All four help keep our place safe, they are super friendly and love to be petted. We usually have our pets upstairs in our apartment but sometimes they like to chill on our deck. So if you’re allergic to cats or dogs our place is definitely not for you. It’s no secret that Bocas del Toro has some of the best waves in Panama, but most do not know that it is also one of the best places to learn how to surf. The peak surf season is from December to March, the waves will be more crowded but the swells will be more frequent with higher periods. Another summer period from June to August offers just as fun waves without so much of the crowd. Normal days with our Surf and Stay package include a delicious breakfast normally from 7-8am and then surf lessons from 9 am to 12 pm. 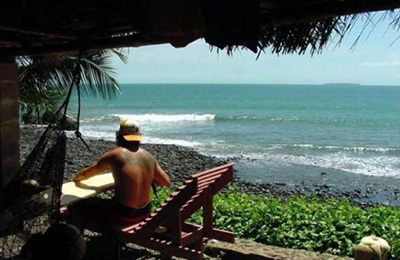 Our classes include transportation to the surf spots, surfboard rental, and instruction. We offer private lessons for our guests. If it’s 4 people or more we can offer special rates as well. Our instructors speak Spanish and English. We offer lessons for children from 7 and up as well as adults of all ages. You can learn to surf at any age! If the conditions are bad no worries we can reschedule or go out for a tour and explore the islands of Bocas del Toro- it’s up to you. If you already know how to surf we can offer surf tours to the best spots. Just ask! 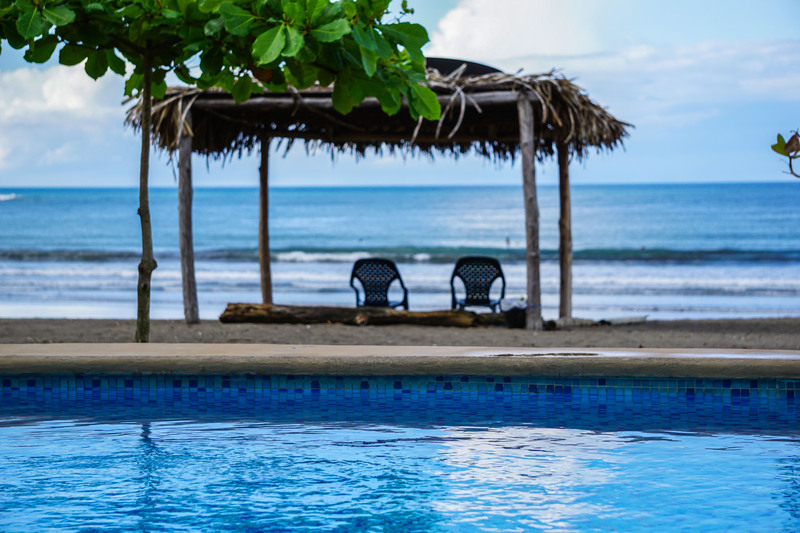 Bocas del Toro Over the Water Surf House is located directly over the water with views of Saigon Bay and the Talamanca mountain ranges that divide the Caribbean Sea and the Pacific Ocean. Our house is only a few minutes walk to the nearest beach Playa Istmito or just a 15 minute bike ride to the nicer beaches such as Tiger’s Tail and Playa Paunch. International flights arrive in Panama City’s Tocumen Airport (PTY). From there you have to take a domestic flight with the only airline that flies to Bocas del Toro called Air Panama. The airport is outside of the Tocumen Airport, so make sure to plan accordingly. If your flight arrives too late it is probably better to stay a night in Panama City. If you have time taxis and Ubers can be used to get around the city to arrive at the Albrook domestic airport. Contact us for assistance. The other option is to take the night bus that leaves around 6/7pm from the Albrook International Bus Terminal. From Panama City, you take a night bus to Almirante, Bocas del Toro on mainland arriving around 5/6am. From there you take a taxi to a water taxi station when you arrive taxis will be there waiting for you just let them know you are going to Isla Colon. Water taxis take about 25 minutes to arrive at Isla Colon. To reach our place when you arrive in Bocas take a taxi to Saigon Adentro. We are two houses to the right of the Punta Caracol office over the water. There is a big yellow sign at the entrance. After this package, we GUARANTEE you will be surfing! This package is perfect for the person that really wants to learn how to surf, enjoy Bocas del Toro, and take the best memories back home. There is no better way to learn how to surf! TOTAL: $500 per person+$50 on and you can rent surfboards the entire day, every day. Our rate includes a delicious big breakfast to start your day. Check out rated for Dec 20th to January 2nd.